After what felt like a couple of months of good progress, I feel like I have hit some roadblocks again. First, there is disagreement among the doctors I am currently seeing as to whether I have hyperparathyroidism or not. The surgeon, who I trust and comes highly recommended, thinks I do. The Wizard, who I also trust very much, does not. In particular, he thinks my labs aren’t high enough to warrant surgery and that there might be other explanations for my labs and symptoms. While the decision is up to me at the end of the day, I honestly would be feeling a lot better about proceeding with surgery with him on board. I don’t want to go against his advice. I don’t want him to get upset with me and I don’t want to jeopardize a great doctor-patient relationship. I trust him very much and I know when he offers advice it is because he is concerned about my wellbeing. But at this point in the game, I trust myself too. And there is evidence in favor of surgery too – the same evidence the surgeon relied upon when deciding to clear me for surgery. I am part of a patient group where I have, literally, seen spreadsheets of patient labs that were diagnosed with hyperparathyroidism, had surgery and got better. My spreadsheet of labs looks worse than some of the other sets of labs I have seen. My labs certainly don’t look as bad as some of the labs I have seen either – they aren’t off-the-charts high. But they do look abnormal and there is a clear upward trend in both my PTH and my calcium. I am not a doctor. However, I do have a PhD in economics and if there is one thing I can confidently do with a high level of expertise, it is recognize a trend in a set of numbers over time. The diagnosis for hyperparathyroidism is based on the labs – and my labs have been trending up over the last 18 months. I also know, from my experiences getting diagnosed with Cushing’s and from reading about the experiences of other patients with hyperparathyroidism, that typically the patients with insanely high labs have been sick with tumors for years. I don’t want to be sick for years – I want to catch as many problems as I can EARLY. The downside to catching things early, as I think basically summarizes my experiences through the medical nightmare of the last few years, is that your labs and scans look mildly abnormal. Would diagnosis be more straightforward if I stayed sick and waited a few years for things to look worse? Probably. Would the damage to my body be irreversible and in all likelihood shorten my lifespan? Probably. I feel like I am being forced to choose between this unending battle to get diagnosed and treated or staying sick until there is a tumor the size of a pumpkin in me that will be impossible to miss on a scan. I don’t want to struggle and fight at all, but if these are the options on the table, I am going to choose to struggle to get diagnosed, folks. In addition to a desire to prevent irreversible damage, I also am stuck living with very real, disabling symptoms right now. I don’t want to sleep half the day and be in pain every night any longer than I have to. Hyperparathryoidism isn’t going to kill me if I wait a few more years to get diagnosed (although some of the other problems might), but it will leave me feeling terrible. And if the surgeon and I are wrong? If I don’t have hyperparathyroidism and he opens me up and finds everything is fine? I will have flown across the country and had unnecessary surgery against my doctor’s advice. This is not an outcome I would be happy about at all, but I am willing to take the chance at this stage. It is a relatively minor surgery and, worst case scenario, we have ruled out the parathyroids as part of my problem. It was the same thing with my thymus. We all agreed the evidence wasn’t 100% clear the thymus was a problem, but the suspicion was sufficiently high (based, legitimately, on my symptoms and scans) that it was worth taking it out and seeing what happened. And even though the pathology hasn’t (at least not yet) confirmed I had a carcinoid there, I GOT BETTER. I stopped coughing and wheezing. I stopped walking around with a purple spot in the middle of my chest. Something happened. Maybe if I had waited a couple of years, gasping for air in the meantime, the tumor would have grown and we would have clearly seen it on a CT and it would have easily been detected in the pathology. I would have a diagnosis in hand and no doubt in the world about it. And there is also a good chance it would have spread and been much more difficult to treat as a consequence. I think I caught it, whatever “it” was, early and there is still a very real chance it has already spread. But at this point in time, I have no pathology report to confirm it and therefore have no treatment plan going forward. Do you see my dilemma? Second, the doctor that really seemed to move me forward several steps, Gandalf, has disappeared. I saw him in July and I thought we made tentative plans to take care of a bunch of items – I was getting an Octreoscan that he was going to look at to see why I was still flushing, he was going to help me get a second opinion on my pathology, he was going to help me get a GI consult if my digestive problems didn’t clear up (and they haven’t). Our plan was to stay in touch via email. I saw him five weeks ago and have emailed him twice, but I haven’t received any response. Not so much as an acknowledgment that he saw my messages. I had hoped maybe my pathology got sent out anyway, but I have called the pathology lab at the hospital and it is still there. Am I being impatient? Has something happened to him? Are my messages going into his junk folder? Is he just incredibly busy (which I would completely understand). Or has he, for reasons I don’t quite understand, become fed up with me and decided he is just going to freeze me out? I don’t think I have been pushy or difficult, and M was with me at our last appointment and agrees everything seemed to be on track, but now I am questioning everything. I just have no idea. None at all. But this is very concerning to me and I don’t feel like I have much choice other than to keep forging ahead without him for now. And I worry that forging ahead without him might also make him mad if it turns out he was just very busy and lining things up in the background while he hasn’t been in contact. But how am I supposed to know and how long am I supposed to wait? Finally, I am really frustrated with the bone doctor. I had high hopes for him when I saw him in July. He ordered tests, sounded like he was going to quickly figure out what was wrong with my sacrum. But I have been back to see him twice now and it feels like am getting nowhere. I showed him an MRI of my sacrum from June of last year that shows masses in my sacrum. At that time, I asked him if he would order an updated MRI – I know if there is going to be any sort of intervention we would need to see an updated MRI no matter what. Instead, he ordered an X-ray and an Octreoscan, which was fine. At the follow-up appointment, he couldn’t find my X-ray in the system at all. Couldn’t find it! And told me to come back in a month, when the Octreoscan was back. I asked him again if he would order the MRI while we waited and he said “let’s wait and see what the Octreoscan says.” So we wait. I see him yesterday for the second follow-up. He hasn’t looked at the Octreoscan or the X-ray and he claims he can’t pull them up and look at them right then and there. So, why the hell am I coming back to see him, for the third time, if he hasn’t looked at any of the scans that were done two weeks ago? I am prepared this time, though, and have the actual CDs of the X-ray and the Octreoscan in my bag. I also have my laptop, which has the scans and the software needed to read them loaded on it, as well as screenshots from the scans. So, I smile and ask him if I can be annoying and ask him to take a look at what I have to show him. What is he going to say, no? For the record, the report from the Octreoscan is annoying too. It says my liver looked “mottled” at 24 hours (meaning there was some suspicious areas lighting up) and so the scan was repeated and now looked normal at 48 hours. So, the conclusion is that my liver is fine. But does this mean my liver is fine or that it isn’t? Carcinoids, if that is what was removed from my thymus in June, often are not found until they have spread to the liver, so it seems pretty important to get a definitive conclusion on this. I know the protocol for the scan is to scan at 4 hours and at 24 hours. I also know that sometimes a 48 hour scan is done if there is significant bowel activity at the 24 hour mark. But the liver is nowhere close to the bowel, so is it kosher to rescan at 48 hours because of suspicious activity in the liver? And if the scan is clear at 48 hours, does it mean the liver is fine or does it just mean that the radioactive material is no longer bound to a tumor? So many questions that I just don’t have the answer to. The other problem with the report is that it doesn’t mention anywhere the fact that there looks to be an abnormality down by my sacrum. That’s right, in the region of my body that prompted the Octreoscan to be ordered in the first place. See that circle and a diagonal dark area at the bottom of the picture (both marked with green arrows)? That looks to be my sacral area as well and also seems pretty dark (the black stuff above is my liver and kidneys and, as they are working to clear the radioactive material from my body, they are supposed to be dark). Is this something significant or is it just noise or incidental uptake? I would be more inclined to believe that if I only saw this happen on one picture, in one scan. 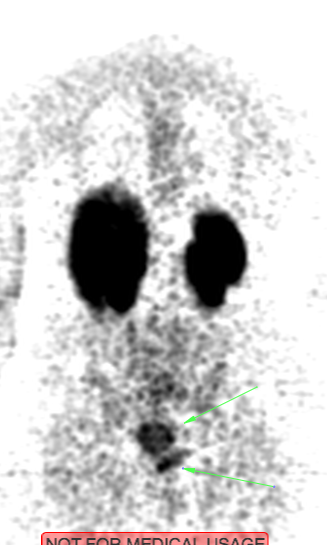 However, given the same area keeps lighting up on different scans, done at different institutions months apart, I think the possibility this is nothing is pretty low. But of course every single radiology report says the scans have no abnormal uptake. I ask the bone doctor if he will please circle back with the radiologist and ask him to look at this again. I also offer to send him an email with exactly these pictures so he can pass them along to the radiologist so he can see exactly what I am talking about. And I do this – I send the email. But I honestly don’t think he will do it. He seems very disengaged during the appointment, like he doesn’t want to deal with any of this. He doesn’t even ask me how I am feeling. All he does is tell me he agrees this doesn’t look normal. And since the Octreoscan is read as normal, he finally orders the MRI of my sacrum. And tells me to come back in mid-October. I keep thinking that the next doctor appointment is going to be the one where everything is going to fall into place. That someone is going to take care of everything, take this out of my hands. That this is going to require less work on my end at some point. The reality is that has not happened yet and maybe it will never happen. But that doesn’t change the fact that I need to keep moving forward until I get all of this figured out, one way or the other.